Which churches in Rome do engaged couples choose for their wedding day? A seemingly embarrassing question, given the ample choice of churches in the Capital, which can actually make it even harder for the bride and groom to make up their minds. In my experience, though, I’ve noticed that in the majority of cases the couple already has a strong bond with a particular church and the choice appears almost obvious. When, on the other hand, I have to counsel the engaged couple, many other factors come into play. These 10 most beautiful churches in rome can be preferred for their history, for the masterpieces they house, for their renowned appearance in books or movies, for their enviable location, or simply for what they represent in the imagination of millions of people throughout the world. 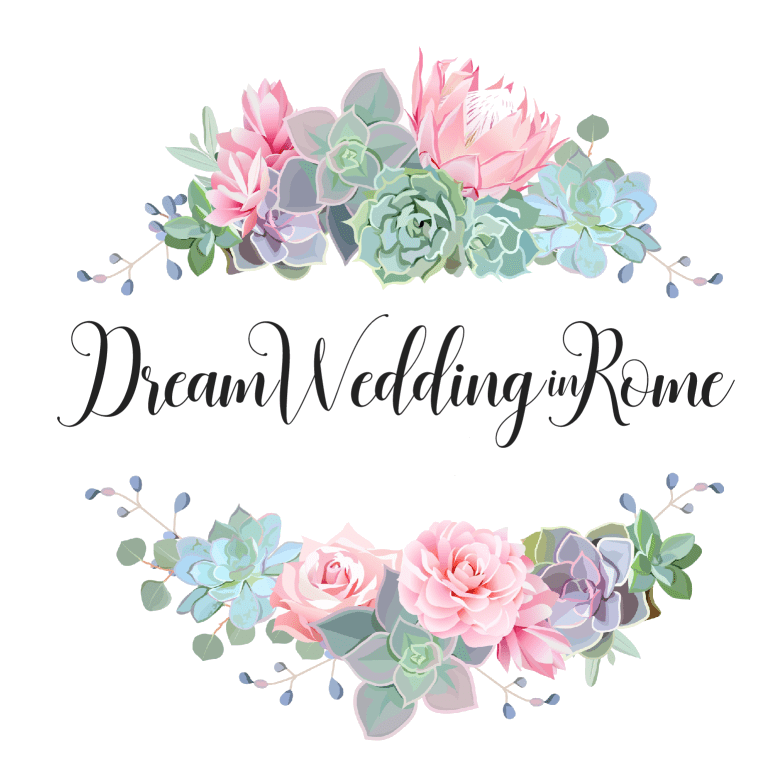 Let me take you through this breath-taking line-up of the 10 churches in Rome preferred by engaged couples (or at least my engaged couples), and discover which one best meets your dreams and wishes! It rises on the highest peak of the smallest but most famous of Rome’s seven hills, the Capitoline Hill. 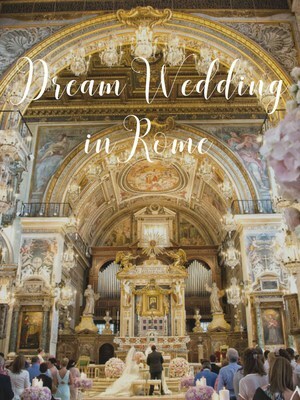 Nestled between the City Council and the Altare della Patria, it can only be reached via a long and steep stairway, putting the bride’s heels (and nerves) to the test, but a breath-taking walk down the aisle makes it definitely worth the trouble. For guests, gaining car entrance from the back implicates a series of permits and authorizations, which need to be planned and requested in advance. The proper name of this church is Basilica di Santi Bonifacio e Alessio, and it is located in Rione Ripa, not far away from the equally famous Chiesa di Santa Sabina. The façade is preceded by a porch surmounted by an attic floor crowned by a balustrade, beyond which sits the beautiful Romanesque bell tower built in XIII century. The Basilica di Santi Giovanni e Paolo al Celio was built on the remains of a house where in 362 the martyrdom of the two Saints took place. Toward the end of the III century, the whole block was acquired by a single owner and restored with the purpose of turning it into a big stately home. At the beginning of the IV century the palace became a place of gathering for the local Christian community, and toward the end of the century it had become a sanctuary in its own right, where the martyrs’ tombs were venerated. 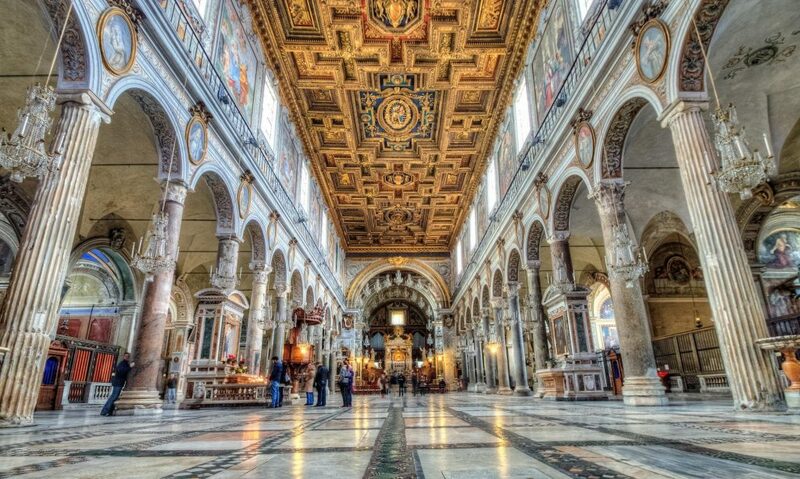 Nowadays it is known as ‘the chandelier’s church’, and it is definitely one of the most elegant and lavish churches in Rome, besides being a celebrities’ favorite. Santa Maria in Montesanto is a church located in piazza del Popolo and it is perhaps better known as Artists’ Church. In fact, since 1953 the church has become home to the “Artists’ Mass”, which is celebrated every Sunday and attended by many representatives of the art and culture world; in addition, it is in this church that funerals of culture and TV personalities are usually held. The Church is located exactly between via del Corso and via del Babuino, a detail to keep in mind since the church is more commonly known as twin church to Santa Maria dei Miracoli, regardless of the noticeable differences between the two. The church is dedicated to S. Francesca Romana, a Benedictine nun who lived between 1384 and 1440 and came to be drivers’ patron saint. Inside the church is a flagstone with that are said to be the imprints of S. Peter’ and S. Paul’s knees. Probably the main reason why this church finds its place among Rome’s favorite wedding churches is its location between the Roman Forum and the Tempio di Venere. It can be reached from Clivio di Venere e Roma, at the corner between via dei Fori Imperiali and piazza del Colosseo, and sits on top of the Velian Hill, cut in half by the opening of via dei Fori Imperiali. The Basilica di S. Maria degli Angeli e dei Martiri was born in 1561 by the will of a Sicilian priest devoted to the cult of angels who dedicated his whole life to this project until the day he died. The construction was commissioned to the great Michelangelo, who realized the project and had the intuition to leave the Roman structures in the rectangular hall of Diocletian’s Baths as they were (while building the latter, several Christian martyrs lost their lives). The Basilica is in Piazza della Repubblica and receives innumerable visitors thanks to its rich offer of artwork and its enviable sundial. Nowadays, this is the church were official ceremonies of the Italian State are held. This church was built in IV century and devoted to the saints Nereus and Achilleus. Located in Riome Celio, not too far from Baths of Caracalla, it sits exactly where, according to tradition, S. Peter lost his foot bandages while fleeing from Rome to avoid martyrdom. 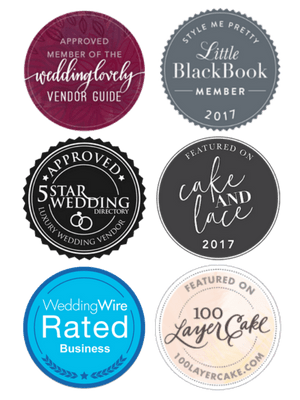 The interior’s beauty and the unique atmosphere that surrounds it make is a favorite among young couples celebrating their wedding. Despite being so close to the majestic and evocative Baths of Caracalla, it remains fairly hidden and isolated, deep in the green pines, oaks and cypresses; an ideal place to take incredible photographs. Chiesa di Santa Maria in Domnica alla Navicella was founded in VII century. Located on top of the Caelian Hill, it sits on an important road junction from Ancient Rome. The name ‘in domnica’ may find its origin from Ciriaca’s name (whose translation from Greek means “belonging to the Lord”) or from the praedia dominica, areas of imperial jurisdiction on whose territories the church was erected. Since its opening, the church has provided services and assistance to the less fortunate. Its alternative nickname ‘alla navicella’ refers to the Roman sculpture of a ship that was initially placed in the square in front of the church, and successively transformed into a fountain by Pope Leo X. If you’re already thinking about the post-ceremony pictures, keep in mind that you will also have the beautiful Villa Celimontana and the Coliseum right next to you! The evocative Chiesa di S. Pietro in Montorio, so called from “Mons Aureus”, a name given to the Janiculum due to its golden marl, fronts onto a stunning landscape that makes visitors feel as if in Ancient Rome, and sits on the exact place where, according to tradition, the Apostle Peter was crucified on an upside-down cross. In the church’s backyard lies the well-known Tempietto del Bramante, made up of sixteen Doric columns and with a round plan. It is adjacent to the fountain of Acqua Paola and to the Arch of S. Pancrazio, contains 150 seats and offers a wide parking area in front of the church. It is last but not least among couples’ preferred wedding churches in Rome.